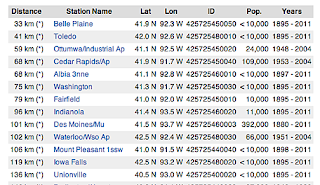 Iowa has 23 USHCN stations ranging from Albia to Washington, but it has no GISS stations on the list, which makes life a little simpler this week. I did continue the study as to how far back to run the temperature averages based on the current population estimates around the stations. The best value for Iowa came out to be only using the average of the last five years data, and that correlates with Nebraska and Texas, while Oklahoma was debatable. 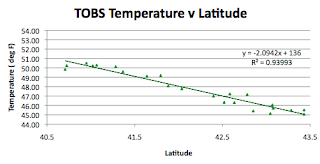 So I’ll continue that check for a couple more states, but it is clear that there is some consistency in correlation between the states. 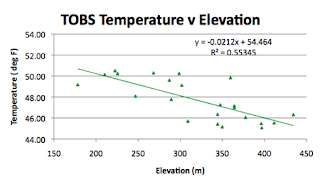 What is interesting about the USHCN stations in Iowa is that most of them are in communities smaller than 10,000 and yet there is the same trend in temperature variation with population that holds true in other states. This is clearly indicating that the Goddard Institute for Space Studies (GISS) is in error to segregate its temperature data with a cut-off of 10,000 as the minimum number it considers for a station. 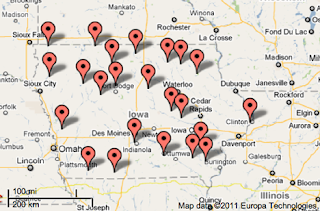 Vide their list for Iowa . 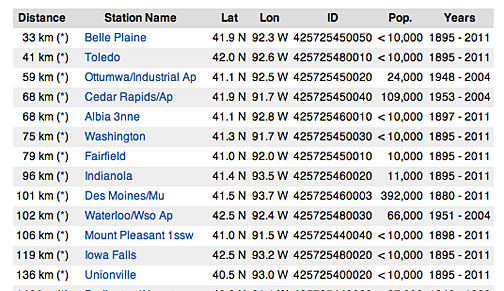 (Although they use none of these stations in the truncated number of US stations that they have shrunk down to). Note the following is just a sample from the list. 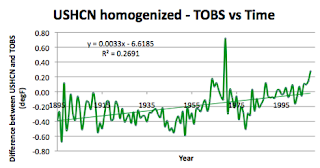 And here is the correlation, using the past 5-year average temperatures for the USHCN stations, using the TOBS data. Average of the 2004-2009 temperatures for the Iowa USHCN stations plotted v local population. Given that the same form of plot is evident in the other states, perhaps it is time for a gentle cough in their direction? The trend for the Time of Observation corrected data shows that temperatures have been rising in the state since 1885, at a rate of 0.5 deg F per century. Iowa is 200 miles wide, and 310 miles long. 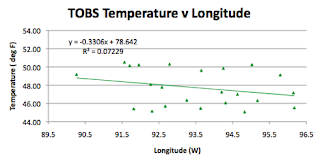 It runs from roughly 89 deg W to 96.5 deg W, and from 40.5 deg N to 43.5 deg N. The center of the state is at Longitude 93 deg 23.1’ W, Latitude 41 deg 57.7’ N. The highest point is at 509 m, and the lowest at 146 m, with a mean elevation of 335 m. The average USHCN station is at 93.5 W, 42.2 N with an elevation of 319 m.
There is the correlation with longitude, which is again likely a by-product of the increasing elevation of the state as one moves west. 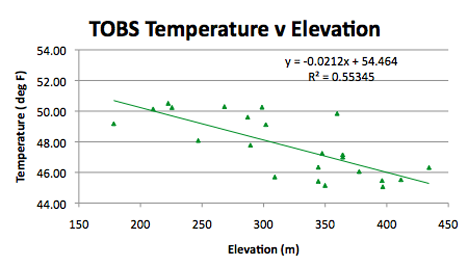 And so we come to the correlation of station population and temperature. 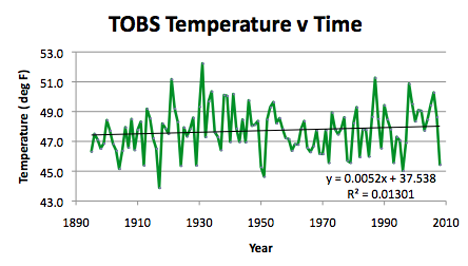 As in the past I ran a secondary calculation looking at the change in regression coefficients as I increased the average number of years averaged to derive the temperature at each station. 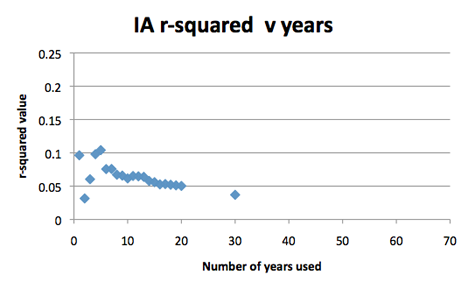 One is 2009, two is the average of 2008 and 2009 etc. The population data in this case all came from the citi-data set, and there were no missing cities to look for. 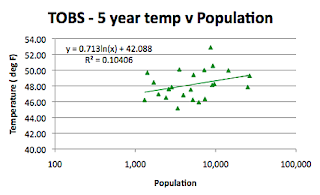 I therefore used the 5-year average data to derive the relationship of temperature with population. 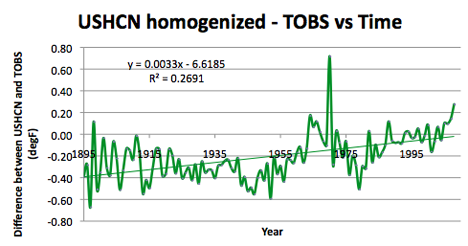 There is still, however, a difference between the homogenized data shown in the USHCN record, and that of the original TOBS temperatures.